Over the past several years, I have been asked numerous times to share lesson plans with other trainers. I have no problem with this and I think it is great. I think Claire Hart's blog (please keep it up Claire) is simply magnificent, as well as the work of 'lesson plan gurus' like Phil Wade. I would love to be able to produce such clear and structured ideas which support the students. So, for the past several months I have been trying to write posts about lesson plans I use in class. The problem is I don't have lesson plans. Or better said, I only have one lesson plan. I recently filled up a my teaching notebook (I use a traditional spiral notebook) and I began transferring the information I needed for continuity into my new one. Since mid-July I have had many great lessons and some which were not so good, but they all started with the same plan. The differences were the choices I made during the lesson. This became readily apparent to me a few weeks ago. In one training project, I run two technical English mini lessons (45 min each), one in the morning and one in the late afternoon. Each lesson has the same plan but they never cover the same thing. Sometimes both are great, sometimes one is disappointing. For example, I wrote down "Examine the electrical system of my car" in my notes, but the only commonality between the lessons were the words fuse and circuit breaker (and the difference + collocations). So, here is my lesson plan. Click on the flow chart to enlarge. I don't use lots of scripted warm-up activities. In most cases, my students have 60-90 minutes in class each week and they want to talk. Sure, there are some confidence issues at first, but it doesn't normally take long for them to come in and start chatting. Indeed, teacher input at the beginning or framework materials can direct the topic and in some cases, I have a specific pathway to follow. Either I have announced (or we decided) the focus of the lesson beforehand, or I have certain needs which must be covered in a specific way. If they do not start talking right out of blocks (or the class is consistently dominated by some) I may use targeted questioning to manage the discussion. But mostly, I want the learners to talk about themselves and ask each other questions. Usually it works easily, but I may need to provide structure (e.g. pair discussions) to assist. Here are some simple examples of framework tasks or targeted questioning if the students don't start talking. Draw a picture of your desk, workplace, apartment/house, etc. What did you do yesterday evening when you got home from work? Let's have a short update meeting, give us a one minute update on your current tasks/project. Of course, the possibilities are endless. In most cases, I consider this phase complete when the conversation moves from teacher driven to learner driven (either in topic or dynamic). Step 2 - What is the topic? At some point, I capture the topic and start to drive the conversation in a productive direction. I have yet to find a topic which does not afford a variety of lessons. Even something seemingly routine and mundane can be manipulated to achieve great results. But some connections are clearer than others. For example, sports leads quite easily into finance. Depending on time, I will need to capture a topic quickly and work toward a focus. Prescribed warmers, framework materials, and immediate input activities (like an article) will, of course, help drive a topic, but I prefer to let them express themselves freely. I tend to remember that they have just left their desks and are looking forward to a few minutes of relaxation. Constraints on the conversation may only cause negative feelings. I am prepared to leave 15-30 minutes to finding a topic. Once the topic has been captured, I will select a focus of the lesson. This is not a lottery. I have genuine expectations for the learners to improve and I have a duty to the customer to provide effective training to improve job performance. I will quickly weigh three factors in determining the focus of the lesson. Part one are the needs (and/or lacks, as Jeremy Day calls them), part two are the expectations for the training and lesson, part three is lesson continuity. Depending on the situation, I will balance these factors. For example, if it is an unusually stressful time in the company/department, it may be best to limit the demands of the lesson and take what you can get. If the company goals trump what the learners expect then the training will have a different focus. But note, this does not mean changing the topic, simply driving the lesson toward a tangible goal. So, I have seven types of lessons which also determine teacher talking time and the quantity of input. I prefer to continuously change the focus of the lesson and I feel uncomfortable (as do the students) when the class repeatedly follows the same pathway. Once I have selected the focus of the lesson, I have taken control of class. In other words, 'We are going somewhere, and I'm going to take you there.' The question is then, how are we going to get there? What is the method? The method often depends on my calculation of resources. 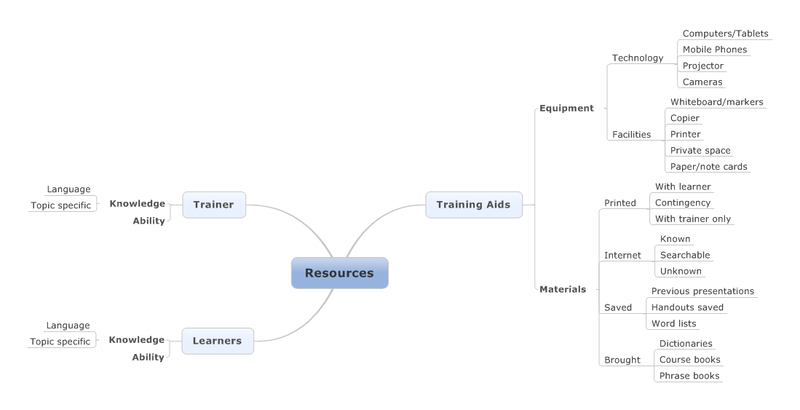 Here is a summary mind map of the resources I consider. Part of this is a complete understanding of what resources are available. 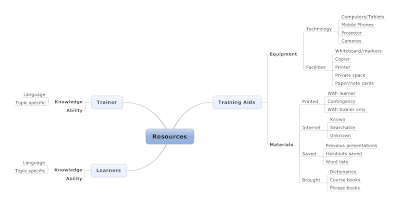 As we remove each resource from the equation, we constrain our ability to design effective exercises. If you have everything mentioned above, the activities are endless. This is also where methodology comes into play. For example, I may use a TTT, PPP, or guided discovery method to teach grammar. I may focus on collocations for vocabulary. Sometimes I even switch to the Silent Way mid-lesson. In some cases, I may even get the idea that we should just keep chatting and have a mainly conversation class punctuated by occasional feedback interludes. But this is not the default setting of the lesson and I'll often clarify this with the learners, "I get the feeling everyone is a little tired from work, is it alright if we just keep talking and I'll give you some feedback?" From this methodology and resources balance, we'll have role plays or listen to a recording and dissect the language. It all depends on the three factors. This is why no lesson is the same. Note: I almost always ask the learners to design their own role play. A 90 minute lesson with tax consultants (B1-B2). They had talked about the need to understand contracts in the previous lessons. The learners have different offices, some work in the consultancy offices and some have offices embedded with a major client. These students travel to the consultancy offices for the lesson. One of them arrives in class with a giant stack of papers (possible resource!). I am curious about the stack of papers and she tells me that it is training material in German (damn!) about recent tax law changes (topic?) and she has to learn it. I ask if she feels 'out of the loop' (boarded) because she's away from management. After a few minutes the conversation centers around the 'milk issue'. When you work at the consultancy, coffee (plus milk and sugar are provided), but they have conflicts when using the milk and sugar at the client (coffee is negotiated and paid by the consultancy). I recognize a prime a topic here (free coffee and the office kitchen are perfect for a variety of lessons). I capture the topic and set a focus. "That is interesting. Okay, today in the lesson we are going to write a contract for the use of the kitchen and the 'milk issue'." I have several resources. First, the learners have probably read more contracts than I have. I know register. We have the internet so template/example contracts are searchable but printing is difficult. I have a whiteboard with five markers. Four are dry, so I have one color. One learner has paper but no pen (I have an extra). There are four students so pair work is possible without an obtrusive trainer. I don't have a private space so while a negotiation might be nice, there is no real place for the two pairs to prepare. I elect for a scaffolded approach to the productive skill (well, it is actually a receptive skills lesson through producing the language). I say, "Okay, before we write the contracts, I'd like to give you a little support because contracts use a specific language." I have 60 minutes left so I am looking at a limited scope, mainly focusing on word choice when changing register. I point out the word shall. Shall has different meanings between everyday British English (which the learners had in school) and contracts. Shall = should + will in everyday English, but must in contracts. A big difference. I bring up a template contract (actually my rental agreement for my condo in Washington DC) to show how shall is used in contracts. This reinforces the point. I point out that shall is a signal word in contracts and I rely on their experience in contracts to find more (and to gauge their ability). I am looking for words like guarantee, continuous, unobstructed, etc. They offer a few, I offer praise. We clarify, with the learners explaining meaning, and move on. My estimation of their language is that they are fairly proficient in socializing and that they struggle when they have to increase their professionalism. On my list of needs is switching register and tone to speak to clients. 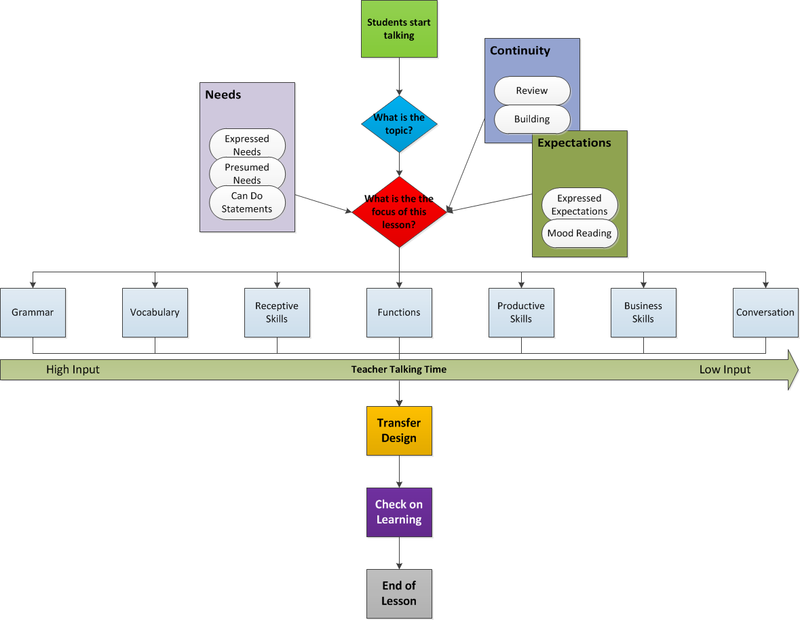 If you have read my blog before about need analysis, I create a table of needs instead of a linear pathway. This topic and focus creates a great opportunity for addressing word choice to affect register. I pull up an old PowerPoint presentation (actually, I disconnected the computer and pasted the table into the client's template) which had everyday informal words on one side and a blank column for formal words on the other. For example, give = provide (this approach was inspired by the The Business coursebook from MacMillan). I wrote down in my notebook that we should look at the Open University video on French influence later. I also wrote the word 'Leo' because Leo Selivan has covered the various lexical layers of English in his talks. The students are tasked with giving formal words with similar meanings. The pair compare results and I add a few missed words (e.g. get = obtain, acquire). Okay, I have 30 minutes left and it's time to get writing. The students write the contract in pairs, I check it over their shoulder for accuracy, they read it aloud to the group. I board key words like aforementioned. We rephrase a few sentences by comparing and contrasting. Done... its all about milk (which costs €.52/L but has an immense emotional value). I have become convinced that it is important to explicitly highlight how the lessons can be applied to the job. During my talk at the BESIG conference Stuttgart on need analysis I said, "The learners don't know what they don't know." I similarly believe that "The learners don't know how to use the lessons unless you tell them." I like to end the lesson with a short reflective session on how the vocabulary, skill, etc. can be used in their job. This is tantamount to commitment and I often record this in my notebook. I may check up on this transfer in a later lesson. In other words, this is part of the continuity factors when deciding the focus of the lesson. I like to have a review session at the end of the lesson. In general, I expect that if I teach it once, they learn it. Of course, this is completely unrealistic and I did not start out this way. But I found that the students themselves felt guilty if they could not give the learning objectives of the previous lessons and said "Ach Scheiße!" if I corrected them on a mistake we had covered. So, I expect the highest of standards. If it is written on the board or sent via email in a PowerPoint... it should be learned. I am understanding, but I don't let them off the hook or justify their non-performance. If it is something I have covered repeatedly with one learner I will put them on the spot in front of the class. Granted, it is wrapped in humor and rapport. But the last phase is to check that they learned. They will often say that they will apply the lesson (response bias) but fail the quiz at the end. My most common method is to remove all supports (erase whiteboard, turn off projector, put away notes) and ask them to summarize the lesson. Use higher cognitive levels of understanding (Bloom's Taxonomy of verbs will help you devise questions). "Sophie, what is the difference between Thanks for calling and I appreciate your call?" "Okay class... I've erased the board. Andreas, please come take the marker. The class will help you recreate everything on the board." So, that's it. That my lesson plan. I wish I could tell you that I control what happens in every lesson, but I am simply a guide to the language. I can only selectively direct each session to meet a specific need or expectation. I would hesitate to say my approach is dogme because my default setting it attain maximum value, which I question about totally free-form teaching. I still follow traditional teaching methods like task-based learning, but within the context of learner content. I cannot give you lesson plans... I can only give you lesson reports. They are quite different. Sorry.